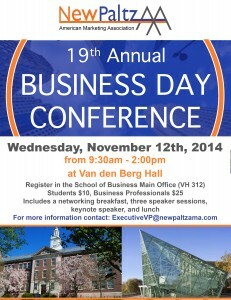 New Paltz’s student chapter of the American Marketing Association (AMA) will hold the 19th Annual Business Day Conference on Wednesday, Nov. 12, from 9:30 a.m.-2 p.m. in Van Den Berg Hall on the New Paltz campus. The conference, which aims to help participants develop the knowledge and skills needed to give them a competitive advantage in the workplace, attracts more than 150 students from New Paltz and surrounding colleges, as well as local and regional business leaders. This year, the AMA is proud to feature Forrest Leighton, a former AMA member who now serves as a marketing specialist at Canon, as the keynote speaker. He is an expert in business strategy, direct sales, and product marketing. Additional speakers include: Debra Pearlman, creator of the S.H.A.R.P Sales Training Program; John Tinghitella, founder of Humble Confidence Inc.; Janet Davis, a noted chef and restaurateur; Robert Michaud, chief marketing officer for Mid-Hudson Valley Federal Credit Union; James Danella, CEO of Media Vision Advertising; and Anthony Martinez, director of communication and investment for Glaceau brands. To register, contact Elizabeth Sydney at executivevp@newpaltzama.com. 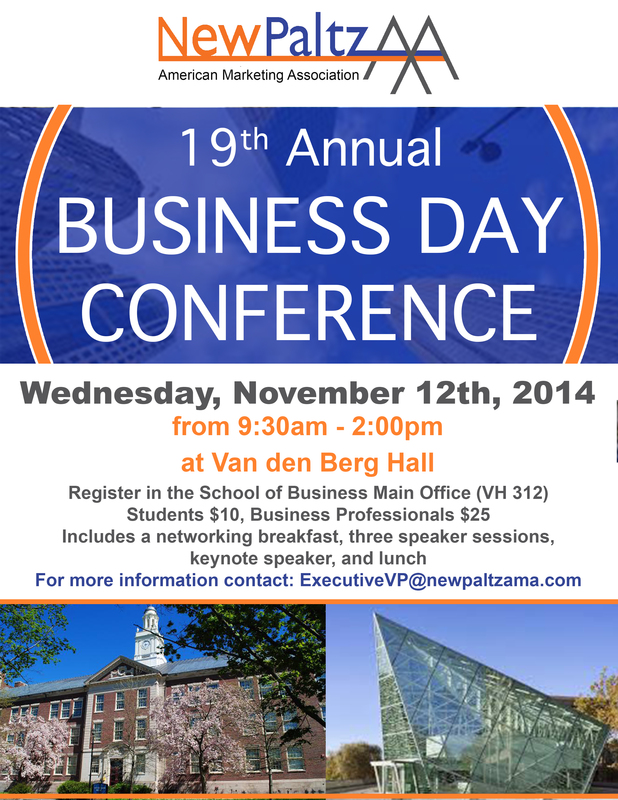 Registration cost is $10 for New Paltz students and $25 for business professionals.